What is Spasmodic Torticollis ? 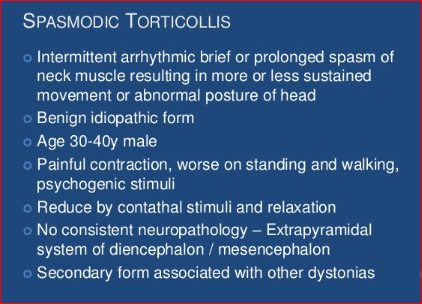 1 What is Spasmodic Torticollis ? Spasmodic Torticollis disorder is characterized by the abnormal head positioning, involuntary muscle, contractions of cervical spine, head tremor and sustained neck spasms and craniocervical pain. Disorder is characterized by the abnormal head positioning, involuntary muscle, contractions of cervical spine, head tremor and sustained neck spasms and craniocervical pain. This phenomenon is an extremely painful neurological movement disorder which results to usual posture of the head. According to NSTA or National Spasmodic Torticollis Association, the occurrence of this disorder is approximately 3 in every 10,000 people and roughly about 90,000 people in the United States are known to agonize this disorder. Furthermore, the condition is said to be originated in the basal ganglia portion of the brain. A disturbance in the homeostasis of chemicals manufacture in the brain is possibly responsible. And one the chemicals known to be is the Acetylcholine that is being affected. According to SpasmodicTorticollis.org, the neurotransmitter or chemical messengers that are secreted from the basal ganglia and travel through via nerve pathways leading to certain muscles of the neck. The increased nerved signals result to cause spasms to occur which cause the head to be pulled per renderings to the left. As the onset of the disorder, patient will experience excruciating pain and may be come worsen as it progresses. In a normal daily basis, patient will have difficulty in standing, sitting, walking and even eating. Medical doctors often misdiagnosed this disorder such as Parkinson’s disease, Wry Neck, or Cerebral Palsy or Dystrophy, but according to them it is not those diseases but Spasmodic Torticollis. Spasmodic Torticollis causes are still idiopathic or in lay man’s term is it “unknown.” Some genetic testing has been conducted and some of it are still on going, they claimed the disorder to be hereditary. In fact, approximately 50% of the Spasmodic population, there is a family history of hand or head tremors or familial or essential tremors. Generally speaking, there is no definite and exact explanation why Spasmodic Torticollis occur or what causes it. Studies are still on going to decipher the mystery behind this condition. 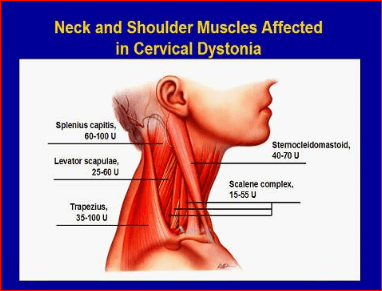 Neck muscles and those between the neck and shoulder will become tense and tender resulting to neck pain. Patient will be reluctant to turn their head to one side, or they may have their head twisted away from the side of discomfort. Peculiarity of the eyes known as Oculogyric crisis, where the eyes involuntarily look upward. Protrusion of the tongue known as buccolingual crisis, where it sticks out involuntarily. Spasmodic Torticollis often begins during adulthood with an average age of 42.9 years for females and 39.2 years old for males. Significantly, the disorder most often occurs in females than males having the ratio of 1.7:1 (one and 7 is to one). For children the occurrence of the disorder is rare. When a child experience twisting of the neck, it is significantly similar but it is a separate condition known as congenital torticollis. This disorder is present in some babies during birth where in the muscle in the neck is shortened causing the head to be tilted to the side. However, the condition can be improved with physical therapy. In 5 to 21% of Spasmodic Torticollis patient experienced trauma or injury to the neck or head before they develop ST. However, this doesn’t mean that it is due to the trauma. ST that occurs after brain or neck injury is clinically different from other condition. Spasmodic Torticollis is being diagnose by using Toronto Western Spasmodic Torticollis Rating Scale (TWSTRS), the common used scale to rate the severity of ST. This test has been widely used to accurately determined the condition of the patient if he or she is highly suspected with ST. There are three scales in the TWSTRS; Torticollis Severity Scale, disability Scale and Pain Scale. These scales are used to describe the severity, including the pain and general lifestyle of ST patient. While there is no specific cure for ST. Considering to seek your medical doctor is highly advice. Note also “Prevention is better than cure”, that is why early treatment is highly suggested even with a mild ST, as this may help to prevent the progression of the disorder. 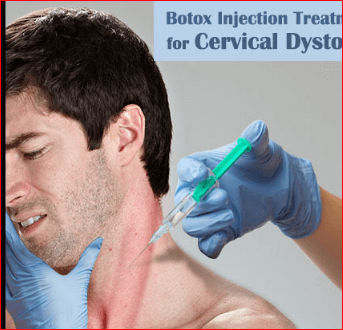 The most widely accepted method in treating the ST is the use of Botulinum Toxin injection. This BoNT helps to prevent the release of Acetylocholine from the presynaptic axon of the motor end plate, paralyzing the dystonic muscle. By deactivating the movement of the antagonist muscle, the agonist muscle is freely allowed to move. With BoNT injections, the patient will experience relief from ST for approximately 12 to 16 weeks. According to MyVMC, administration of intrathecal baclofen via cervical spine has shown success in treating ST. After the treatment, patients have been reported an increased in terms of their motion of the neck muscles. However, though IT alleviate the ST, there were some side effects reported such as drowsiness, somnolence, dizziness, headache and nausea. this treatment happens in the basal ganglia and thalamus region of the brain. It is being consider as the most successful treatment for tremors of the Parkinson’s disease. The treatment includes stimulation of Globus pallidus internus or the sub thalamic nucleus. The device is comparably similar to a pacemaker wherein an external battery is positioned subcutaneously with wire through the skin and enter the skull to a region of the brain. In order to stimulate the Globus Pallidus Internus, the microelectrodes are sited into Globus Pallidus Internus bilaterally. When the surgery is done, multiple trips are required to program the settings for the stimulator. The stimulation of the GPI interrupts the abnormal discharge pattern in the GPI, thus causing to an inhibition of hyperactive cortical activity. This type of management include biofeedback, mechanical braces and selfperforming a geste antoniste. By performing physical therapy such as stretching and strengthening exercise aid to help to return the head in proper alignment with their body. A significant study also that through physical therapy, the severity and pain have been reduce pivotally as well as the increases postural awareness and quality of life was found.